Following a low-calorie diet can mean saying goodbye to something you love to eat with no healthy options. Luckily, pastry doesn’t have to be one of those foods. You can still enjoy this delicious favourite by switching to a low-calorie alternative. Pastry has a very bad reputation with dieters, it’s packed with high levels of fat and calories but don’t despair, turn to filo pastry. Filo pastry has much fewer calories - 80 calories for 2 sheets of pastry! It features very strongly in Greek and Middle Eastern cookery but it’s now hugely popular here and is usually bought in frozen rolls. Making filo from scratch is only for the bravest, the recipe is quite fiddly and you have to stretch it endlessly to achieve the famous paper thinness. Defrost the filo as instructed. As long as you handle the sheets carefully and keep them covered with a damp tea-towel, you can turn them into limitless low-calorie dishes. Try chopped apple and a sprinkle of cinnamon with a few scattered raisins for a traditional fruit filling. Mix some freshly cooked and cooled spinach with low-fat cottage cheese, plenty of black pepper and an egg to bind. This makes a fabulous savoury filling when cooked in the filo case. 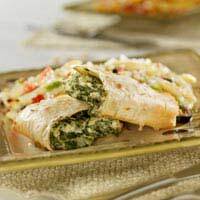 It’s inspired by the popular use for filo pastry in Greece - Spanakopita. Using a base of filo to make tartlets with a muffin tin, spoon a little low-fat custard into the bottom of the tarts. Bake until set (about 180C for 15 minutes) and top with fresh, sliced fruit to serve. For a Chinese filling, try stir-frying bean sprouts with finely chopped vegetables and a teaspoon of Chinese 5 spice. If you prefer an Indian flavour, omit the 5-spice and add curry powder instead. Low fat cream cheese is another versatile filling- it can be mixed with freshly chopped herbs, caramelised onions or even chopped fruit, berries or jam. Make sure you follow all the directions on the packaging to defrost the filo pastry. Carefully unroll the pastry and peel the number of sheets you need from the roll. Cover the remaining sheets with a damp tea-towel. It’s recommended you brush melted butter between the sheets of filo to keep them pliable. This is a disaster for low-calorie dieters so use oil sprays instead. It’s possible to buy butter flavoured sprays which are an ideal substitute. Cut 3-4 sheets into squares. Use a non-stick muffin tin and push the multi-layer pastry in the moulds to create tartlets. Fold the leaves over the top to create a pie-effect. Cut 2-3 sheets into large squares and place a teaspoon of the filling in the centre. Moisten the edge of the pastry with a wet finger and fold the filo up into a triangular shaped ‘samosa’. Make spring roll or cigar shapes by cutting the pastry leaves into rectangles. Bring the two shorter ends up into the centre and finish by rolling the pastry into a cigar around the filling. Create dim-sum type dumplings by cutting 2-3 layers into rounds with a pastry cutter. Draw the edges up and pinch to create a pretty little parcel. Low calorie food isn't the end for pastry but the beginning for new ideas. Watching out for calories is just a case of taking your favourite foods and adapting them to suit your changed needs, filo pastry is a perfect illustration of this idea.